Stand Up for SINGAPORE: Singaporeans are asking of the PAP government: do you really know what you are doing? Singaporeans are asking of the PAP government: do you really know what you are doing? 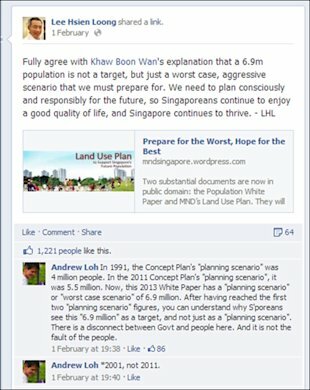 The government has tried to explain the 6.9 million figure and assure Singaporeans that it is only a planning parameter, a “worst-case scenario”, that it’s not a target which the government is working towards. But the damage has already been done. Singaporeans will only – mostly – remember the figure “6.9 million” as the main message of this White Paper. And truth be told, Singaporeans are not wrong to view the figure with cynicism and skepticism, given how past numbers were also breached. It is quite ironic that PM Lee had, after the general election of 2011, urged his government officials to focus on and improve on the way they communicate with the public, to better explain policy decisions so that Singaporeans will understand better why the government does certain things. It is ironic because the White Paper itself fell far short of achieving this. Instead, it attracted derision and criticism from various quarters of the public. 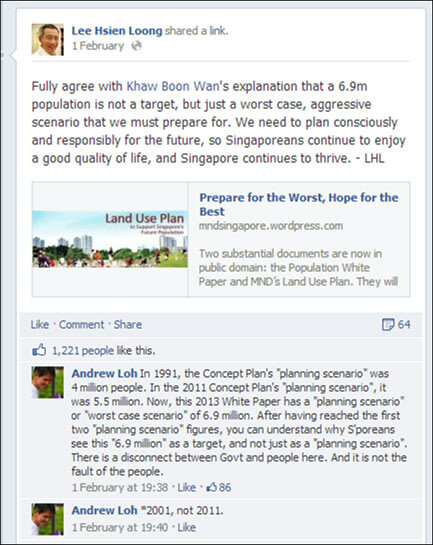 Even several of the PAP’s own MPs failed to fully support it. It gives the perception of offering a shared vision of Singapore when it is not. It offers little other lifestyle choice to Singaporeans except that of an urbanized setting. It is the outcome of forms of engagement such as town halls and traditional meetings that do not cover deeper sparring of ideas and options. Others ridiculed the lack of rigour in the paper itself. This was shown up by the two amendments made to the Paper: one to remove the wordings “population policy”, and the other to remove the word “nursing” from the footnotes which had included nursing as a “low-skilled” job. It caused unhappiness among nurses here, and prompted the President of the Singapore Nursing Association to write a letter to the Deputy Prime Minister and the Health Minister. Various economists also slammed the Paper for its lack of references and substantiation on various claims and points made. In brief, the Paper was a shambles. There are many lessons for the government (and the PAP) in this episode, and I am sure the party will conduct its own internal assessment. What is of more importance, and what should concern the government more, is the question of trust among the people. Some have said, in private, that they are concerned that the government which professes to let in more foreigners to further and artificially inflate our population, is one which can’t even get a White Paper done right. Or at the very least, communicate its message effectively and clearly. Such remarks are not facetious. As the PAP government once said of opposition members: if you can’t get the small things right, how are you going to do the big things? And if you are unable to carry the ground with you, especially on something as momentous as increasing the population, how are you going to have the moral authority to lead? And without such moral authority, how are you going to hold together what would be a significantly more diverse society – a politically and culturally different societal make-up in the years ahead? Singaporeans are anxious, seeing how the government has been unable to deal with current problems the last few years, notably that of public transport, public housing, and an income divide. Although there are signs that it is getting a handle on things in these areas, the challenges going forward are quite different and Singaporeans are rightly concerned. Having lived through the increase and then the squeeze (and not just in the physical sense) of a larger population the last few years, Singaporeans are naturally skeptical when the same government tells them “not to worry”. The daily experiences of each Singaporean tells him or her that life in Singapore has changed, and not necessarily for the better. So, to put it simply, Singaporeans are asking of the PAP government: do you really know what you are doing? And it must start by first showing that it can get the small things right. Andrew helms publichouse.sg as Editor-in-Chief. His writings have been reproduced in other publications, including the Australian Housing Journal in 2010. He was nominated by Yahoo! Singapore as one of Singapore's most influential media persons in 2011.